The identification of polymorphisms and/or genes responsible for an organism's radiosensitivity increases the knowledge about the cell cycle and the mechanism of the phenomena themselves, possibly providing the researchers with a better understanding of the process of carcinogenesis. The aim of the study was to develop a data analysis strategy capable of discovering the genetic background of radiosensitivity in the case of small sample size studies. A complete step-by-step strategy for seeking the genetic signature of radiosensitivity in the case of small sample size studies conducted on mouse models was proposed. It is shown that the strategy, which is a combination of mathematical modelling, statistical analysis and data mining methodology, allows for the discovery of candidate polymorphisms which might be responsible for radiosensitivity phenomena. Radiosensitivity is the relative susceptibility of cells, tissues, organs or organisms to the harmful effect of radiation. Effects of radiation include, among the others, DNA mutations, of which those observed in genes responsible for DNA repair (e.g. XRCC1 in base excision repair) are believed to be the most dangerous ones from a radiosensitivity point of view . Nowadays, low-dose radiation and its effect (not immediately noticeable) is a leading topic because of the problems with collecting reliable data and its long-term biological consequence . As with sensitivity to sunlight or to chemotherapeutic drugs, sensitivity to ionizing radiation shows variation among individuals . It has been shown that radiosensitivity is a heritable trait of our organisms shaped by environmental factors . The quantification of the cancer risk associated with ionising radiation requires mapping and identification of the genes that affect risk. This will eventually lead to the prediction of individual sensitivity. Although a large amount of data has already been obtained, the identification of genes potentially involved in radiosensitivity for the prediction of individual cancer risk is not complete and further analyses are required. The majority of studies reported in the literature are of the Genome-Wide Association Studies (GWAS) type, where the inter-individual variability must be considered in a process of data analysis. By definition, GWAS projects require both, a large number of polymorphisms, usually Single Nucleotide Polymorphisms (SNPs), and a large number of individuals to be analysed to achieve the required level of Family-Wise-Error-Rate (FWER) [5, 6]. An alternative strategy is that the a priori chosen candidate SNPs are analysed in a smaller group of individuals, which allows the following of some signal pathways in the organisms in detail . The experimental design used in our study is a hybrid of these two. The number of SNPs analysed stays large (even higher than in regular GWAS projects), but the sample consists of the animals selected from the inbred mouse strains, which results in the limitation of the overall inter-individual variability. The sample consisted of 14 inbred mouse strains. The number of biological replicates per mouse strain ranged from 1 to 3 (Table 1). All investigated mice were females approximately 10-12 weeks old when they were euthanised. 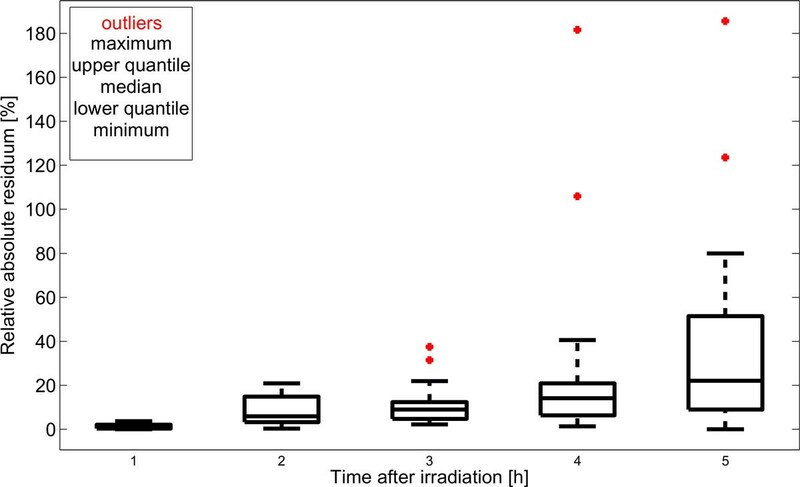 The sensitivity to irradiation was indirectly assessed with the use of the G2 chromosomal radiosensitivity assay (G2CR) [8–11]. Enhanced G(2)chromosomal radiosensitivity is a consequence of inherited defects in the ability of cells to process DNA damage from endogenous or exogenous sources, of a type that is mimicked by ionizing radiation, and that such defects predispose to breast and colorectal cancer [12–16]. Lipopolysaccharide/Concanavalin A were isolated and grew up in RPMI for 48h. Proliferating cells in G2 phase were extracted and ex-vivo irradiated with a dose of 1.5 Gy. The irradiations were performed using a Siemans Stabiliplan-1 X-ray set, running at 250V (constant potential) with a Cu/Al filter producing a beam of 1.2 mm HVL Cu at a dose rate of 0.73 Gyˆ-1. The number of chromatid breaks and gaps was counted and normalized per 100 cells from one mouse. Colcemide was added at 1, 2, 3, 4 and 5 hours post-irradiation with cells harvested 1 hour later to collect the measurements. 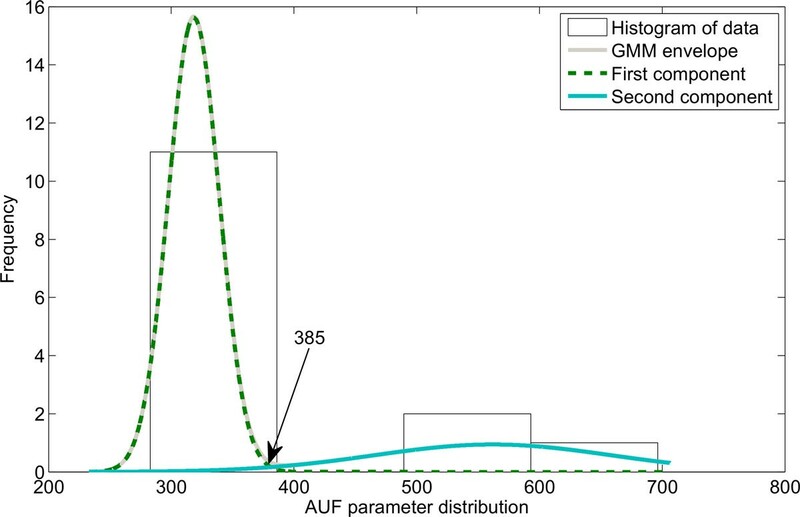 The relative number of chromosomal aberrations, defined as the difference between after and before irradiation G2CR values was used for further analyses . The data on genome-wide single nucleotide polymorphisms (SNPs) were collected from the Center for Genome Dynamics Mouse SNP Database (CGD SNP database)  and consisted of the information on 7,849,649 polymorphisms genotyped for all analysed mouse strains (Table 2). List of mouse strains tested in G2CR assay with a number of biological replicates. Number of SNPs (loci) genotyped for all analysed mouse strains. 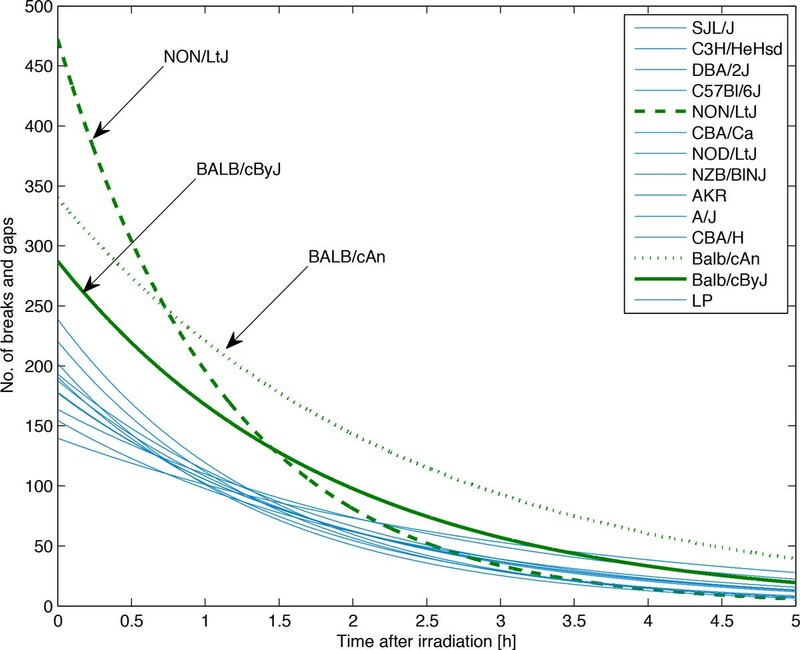 The yield-time curve of radiation-induced chromosomal aberrations, indicative of radiosensitivity of late stages of the cell cycle, was modelled by an exponential function in time (Eq. 1), with two parameters: k (gain, responsible for the initial induction of chromosomal aberrations) and T (time constant, related to the speed of the modelled process). The Levenberg-Marquardt (LM) nonlinear least squares method was used for parameter estimation. In the case of a few biological replicates the final parameter value for the mouse strain under investigation was calculated as the average of the values obtained for every biological replicate. The convergence of the LM algorithm was checked to ensure the stability of the parameter estimates. The mean relative absolute residuum was used to assess the quality of model fitting. The distributions of both, k and T parameters, and the area under the yield-time curve (AUF) were subjected to Gaussian Mixture Model (GMM) decomposition , where the probability density function is presented as a convex combination of the constituent probability functions. 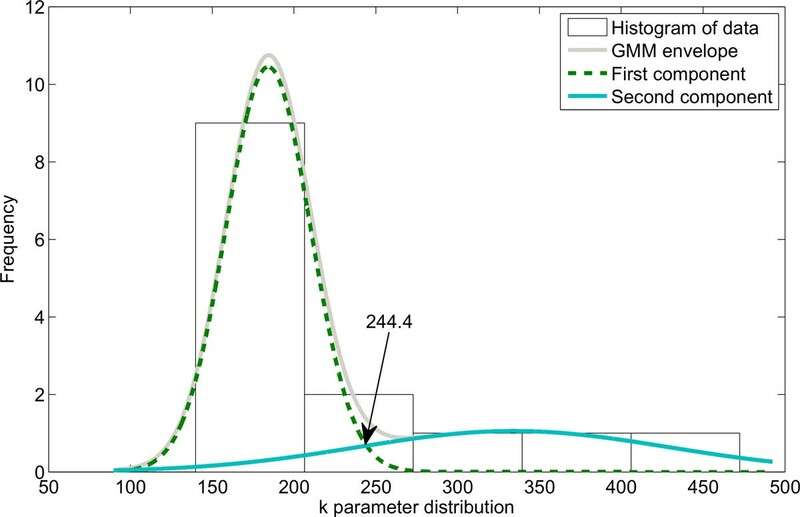 GMM allows for the construction of mice subpopulations characterized by different kinetics of the chromosomal aberration yield-time curve and it has the ability to create soft boundaries between clusters accompanied by the probability of belonging to a particular class. The Expectation-Maximization algorithm (EM) was used fo ther maximization of the likelihood function, accompanied by the Bayesian Information Criterion (BIC) for model selection [20–22]. The standard GWAS projects require the statistical tests to be performed for every SNP independently, and the correction for multiple testing to be applied afterwards to control the level of FWER. Having only a collection of 14 mice, split into two groups, we propose the most conservative approach to be applied. The SNP is going to be classified as a candidate relevant SNP if and only if the allele at that SNP is identical in all the mouse strains assigned to one group, and identical but different from the previous group in all the mouse strains assigned to the other group. To verify the hypothesis of the non-random distribution of candidate relevant SNPs along chromosomes, the r-scan test was applied. The null hypothesis states that the locations of identified candidate relevant SNPs are independent and uniformly distributed along the chromosome. The alternative hypotheses of interest are, first, that the points tend to occur in a clumped fashion, or second, that they tend to occur in a regularly spaced fashion [23, 24]. The selection process led to the identification of candidate relevant SNPs, the most interesting of those being non-synonymous SNPs (nsSNPs). Polymorphisms of this type lead to a change of the amino acid in the protein sequence. To assess the impact of nsSNPs on the organism, widely available programs were used: teh PHANTER (Protein Analysis Through Evolutionary Relationships) Classification System , PhD-SNP (Predictor of human Deleterious Single Nucleotide Polymorphisms) , SNAP (Synonymous Non-synonymous Analysis Program) , SIFT (Sorting Intolerant From Tolerant)  and PolyPhen (POLYmorphism PHENotyping) ver. 2 . Each of them predict, with some probability, whether the amino acid change could cause a deleterious effect. Most of the algorithms use the information about protein evolutionary sequence conservation. Some of them (e.g. PolyPhen) utilize additional information, such as the annotation and protein structure. Additionally, when nsSNPs result in the substitution of amino acids involved in phosphorylation (changing Serine, Threonine or Tyrosine), it is possible to assess the group of protein kinases (PK) that could be blocked in the investigated position. To address this issue, GSP ver. 2.1 (Group-based Prediction System)  was used. The CGD database contains information on genome-wide polymorphisms for 74 mouse strains, fourteen of those were used in our study to construct a set of candidate radiosensitivity relevant SNPs. The remaining 60 mouse strains were subjected to in silico radiosensitivity prediction. The proposed similarity score shows the similarity between the mouse strain under investigation and the pattern defined by the radiosensitive group of mice at candidate relevant SNPs. It ranges from 0 [none of the alleles are identical to the allele in the pattern defined for radiosensitive mice at candidate relevant SNPs) to 100 (alleles for all candidate relevant SNPs ale identical to those in radiosensitive pattern) and is calculated as the percentage of polymorphisms with allele identical to the form observed at candidate relevant SNPs for all radiosensitive mice. The distribution of the similarity score was analysed and the method for outlier detection by Hubert and Vandervieren  was applied to detect additional candidate radiosensitive mouse strains. In order to illustrate the relationship between 74 mouse strains, a phylogenetic tree was created using the UPGMA algorithm (Unweighted Pair Group Method with Arithmetic mean) . The distance matrix was calculated with the Jukes-Cantor method  with evolutionary distance estimated for candidate relevant SNPs only. The collected G2CR measurements are presented Figure 1. There was no case where the LM nonlinear least squares algorithm was divergent. 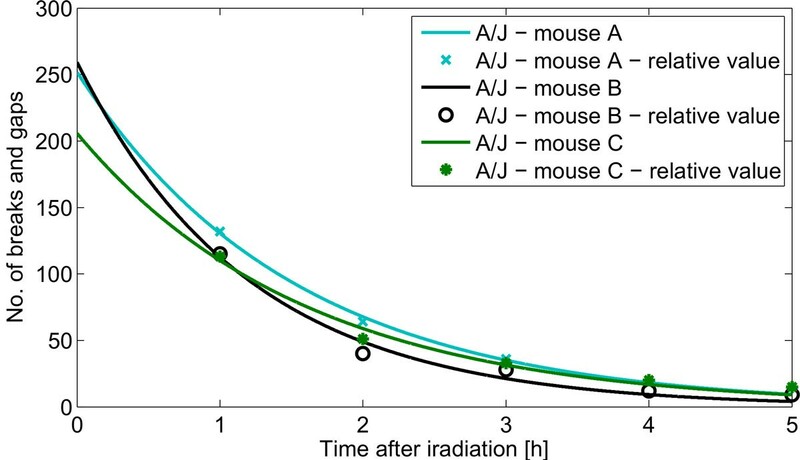 An example of fitting model for A/J mice is shown in Figure 2. Table 3 gives the estimates of both the gain (k) and time constant (T) parameters for all of the analysed mouse strains. The area-under-function (AUF) values are also included in the table. The absolute relative residua ranged from 1.e3-14% to 185.57%, and were the smallest by average for 1h after irradiation, and the highest for 5h after irradiation. 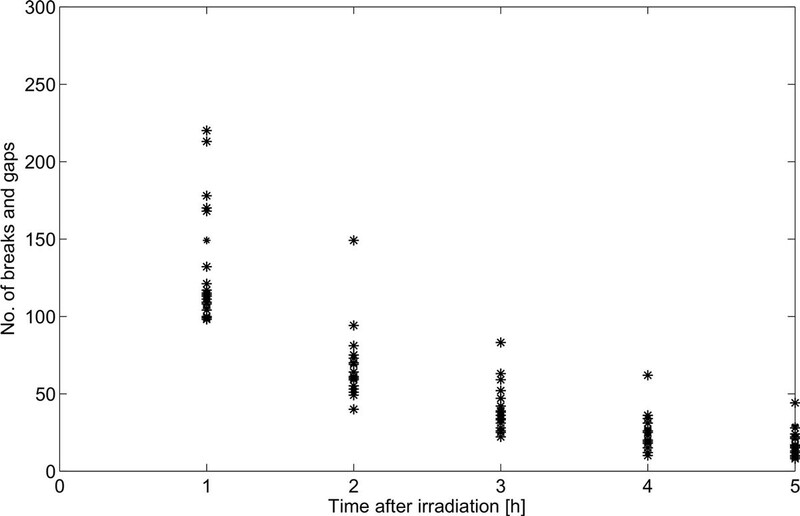 Figure 3 presents their distribution depending on time after irradiation. The observed high error values obtained for 4h and 5h stem from limitations of the assumed mathematical model. In some cases, one can observe the unrepaired breaks and gaps resulting in a non zero steady state value. Since the model curve tends to 0 with time tending to infinity, the relative error increases significantly. Graphical presentation of G2CR levels in time for all analysed mouse strains. The exemplary results of model fitting versus raw measurements. Solid lines present the results of model fitting, while symbols (stars, circle and cross) mark corresponding raw measurements. Each mouse strain is described by different color. Estimates of k and T parameters obtained by LM NLS algorithm. Boxplots of absolute relative residua for model fitting depending on the time after irradiation. Horizontal bold line marks median value, upper and lower rectangle sides show upper and lower quartiles respectively, red dots are used to mark the outliers, and whiskers present minimum and maximum values (with outliers being skipped). GMM technique was applied to obtain the criteria for mouse classification. Figures 4, 5, and 6 present the histograms of the decomposed parameters together with their mixture model. Maximum conditional probability criterion was used to decide on subpopulation definition, the threshold values obtained were equal to 244.4 for gain (k), and 385 for AUF. The threshold value in the T-domain cannot be identified due to the single component model. The radiosensitive subpopulation of mice was defined as those with a k-value above its threshold or an AUF above its threshold. The second group, named the regular responder subpopulation, consisted of the remaining mouse strains. 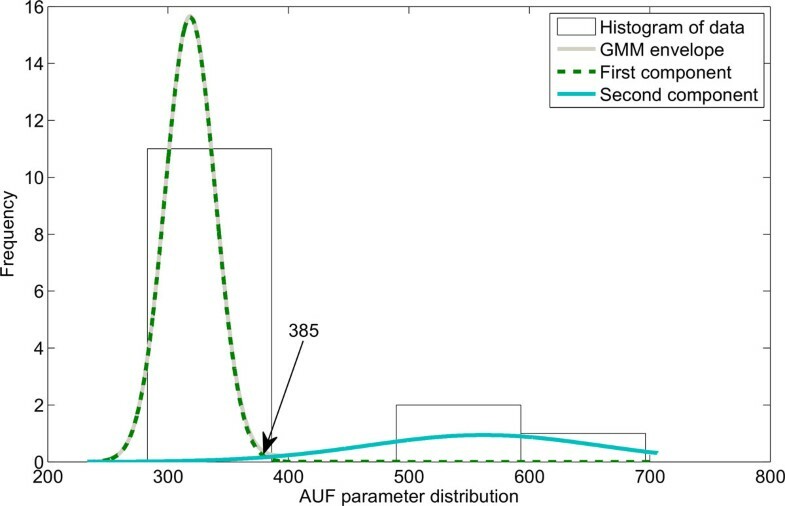 Figure 7 shows the model yield-time curves of chromosomal aberrations with GMM distinguished mouse subpopulations. The following mouse strains were classified into the radiosensitive group: BALB/cAn, BALB/cByJ and NON/LtJ. GMM decompositions of gain k parameter distribution together with obtained threshold value for mouse subpopulation definition. Green, dashed line and blue solid represent GMM model components, while grey solid line represents GMM envelope. GMM decompositions of AUF parameter distribution together with obtained threshold value for mouse subpopulation definition. Green, dashed line and blue solid represent GMM model components, while grey solid line represents GMM envelope. 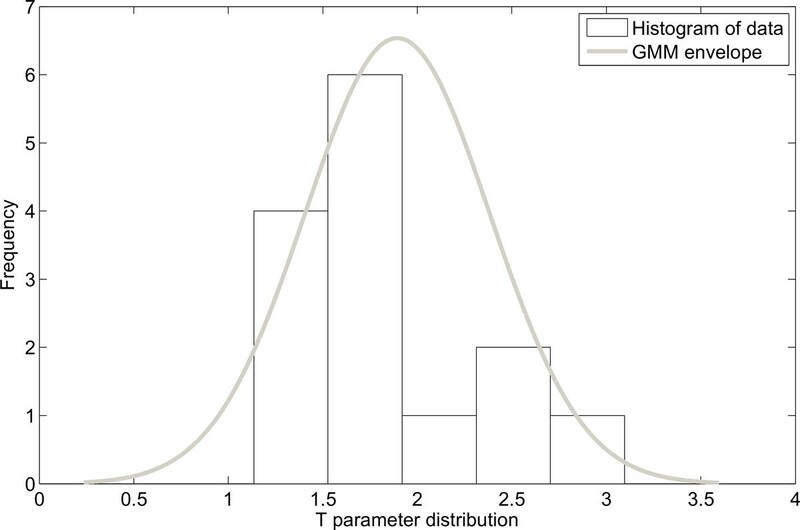 GMM decompositions of time constant T parameter distribution. Grey solid line represents GMM envelope. The final models of the G2CR yield-time curve. Radiosensitive mouse strains are marked green, while regular response mouse strains are marked blue solid line. The SNP selection was performed following the algorithm described in the Materials and Methods section, and 1857 candidate relevant SNPs were found. Because of different reference/variant frequencies at every SNP, it is not possible to provide the exact number of the candidate relevant SNPs expected by chance. Assuming that the variant allele is observed among radiosensitive mice, and the reference allele is present in regular response mice, the probability of such a configuration is equal to p3 (1 − p)11, where p stands for the variant allele population frequency. The overall variant frequency, obtained as a weighted average of variant frequencies at every chromosome (Table 4), is equal to 9.62%. So the expected number of relevant SNPs found by chance is equal to (0.0962)3(1 − 0.0962)11 7,849,649 = 2297 and is higher than the number found as candidate relevant SNPs. However, a detailed inspection performed for every chromosome independently shows that there are some chromosomes with overrepresentation of found candidate relevant SNPs, while there were no candidate SNPs found for some of the other chromosomes (Table 5). Estimates of variant allele frequency, pSNPs stands for polymorphic loci. Distribution of relevant SNPs along the chromosomes. As seen in Table 5, there are some chromosomes with a significantly higher number of candidate relevant SNPs and other chromosomes with a significantly lower number of that type of loci. This suggests that there are chromosomes with a clumped distribution of relevant polymorphic loci. R-scan test was applied to verify the hypothesis of the uniformity of location. Applying the r-scan test (with r equal to 1) to the distribution of candidate relevant SNP locations along chromosomes gives p-values less than 1e-12 for every chromosome, and allows for the rejection of the null hypotheses. Figure 8 shows a graphical illustration of the distribution of candidate relevant SNPs' locations. Candidate relevant SNPs concentrate in 29 clusters located in 28 genes. The list of these genes together with a functional classification of candidate relevant SNPs is presented in Table 6. Among 1857 candidate relevant SNPs, 48 are located in exons, 880 in introns, 14 in UTR regions, and 915 in intergenic regions. Two genes, Htr5b and Ccdc93 seem to be at highest risk of their product being modified. The candidate relevant SNP clusters along chromosomes. Plot presents the location of detected clusters of relevant SNPS (marked as green dots) at particular chromosome. Number of relevant SNPs located across the chromosome is showed on the right side of panel. The gene location of candidate relevant SNPs and their functional classes. Eight SNPs, located in 5 genes, appeared to be nonsynonymous (nsSNP) alerting the amino acid sequence of a protein. Detailed information is presented in Table 7 while Table 8 gives more data on the predicted impact of detected nonsynonymous SNPs on protein function. Nonsynonymous SNPs resulting in the substitution of amino acids involved in the process of phosphorylation, were checked with the GPS algorithm in order to predict their effect on protein kinases (PK). Two nsSNPs, rs48840878 (Msh3) and rs5144199 (Cc2d2a) were predicted as having increased probability of a deleterious effect, with one of them capable of disordering phosphorylation with 14 PKs (Table 9). All of above mentioned genes had their gene ontology terms and signalling pathway participation analyzed. Msh3 has 28 major GO terms assigned, among which the most relevant in a radiosensitivity context are DNA repair, mismatch repair, or meiotic mismatch repair (GO:0006281, GO:0006298, GO:0000710). The KEGG database brings up two signal pathways related to cancer development in humans (hsa05200, hsa05210) with Msh3 involved. There are reports in the literature on other Msh3 polymorphisms involved in radiosensitivity of breast cancer patients . Htrb5 has 12 GO terms specified, mainly related to G-protein coupled receptor activity and signaling pathway (GO:0004930, GO:0007186) and serotonin binding, receptor activity, and signaling pathway (GO:0051378, GO:0004993). G-protein-coupled receptors (GPCRs) have recently emerged as crucial players in tumour growth and metastasis , there are many reports on the active role of serotonin in cancer development [36, 37]. Cc2d2a gene is related to cancerogenesis through involvement in the Smoothened signalling pathway (GO: GO:0007224) . Mutations in gene Ccdc93 are associated with several cancers in humans, with similar observations are for Galnt6, which is probably involved in breast cancerogenesis through O-glycan processing (GO:0016266) . Nonsynonymous SNPs found among candidate relevant SNPs. Predicted impact of detected nonsynonymous SNPs on protein function. Protein kinases predicted to be effected by Msh3 phosphorylation related to nsSNP rs48840878 and FNLEKMLSKPESFKQ protein sequence. In silico prediction of radiosensitive mouse strains. In silico analysis of candidate relevant SNP similarity score distribution among the remaining 60 CGD mouse strains allowed for the identification of two mouse strains with genetic profiles very similar to the profile of GMM distinguished radiosensitive mice (BALB/cAn, BALB/cByJ and NON/LtJ) - Figure 9. The most similar was SEA/GnJ which has a 95.26% genetic consistency with the radiosensitive pattern. 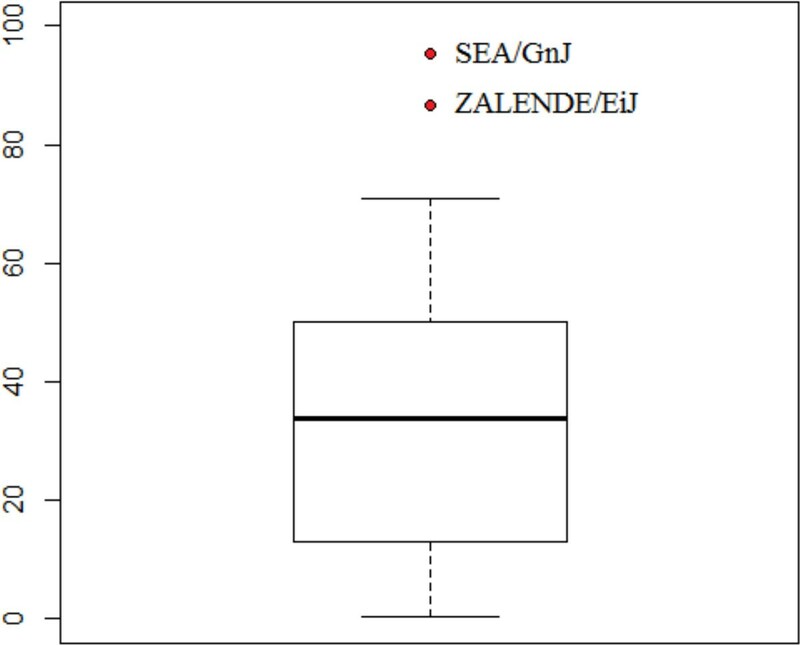 The second in line, was ZALENDE/EiJ, with a similarity of 86.53%. The phylogenetic tree, constructed in the domain of candidate relevant SNPs, shows an evolutionary relationship among analysed CGD mouse strains (Figure 10). The boxplot of candidate relevant SNP similarity score, constructed for remaining 60 CGD mouse strains. Horizontal bold line marks median value, upper and lower rectangle sides show upper and lower quartiles respectively, red dots are used to mark the outliers, and whiskers present minimum and maximum values (with outliers being skipped). Candidate relevant SNPs based phylogenetic tree of CGD mouse strains. GMM distinguished radiosensitive mouse strains are marked green, in silico predicted radiosensitive mouse strains are marked red, remaining CGD mouse strains are marked black. The proposed strategy for data analysis, which is a combination of mathematical modelling and data mining techniques, allows for the discovery of candidate, trait relevant SNPs in the case of small sample sizes. The effectiveness of the designed methodology was demonstrated for the exemplary problem of seeking the genetic background of radiosensitivity. From the group of candidate relevant SNPs and genes related to those, the analysis revealed that two genes are, according to the literature study, highly significant for the analyzed phenomena of radiosensitivity. One might be responsible for the process of DNA damage repair. The second is indirectly responsible for cell adhesion and was observed to be up-regulated in breast cancer patients. To increase the power of the performed analyses, the biological validation of the obtained putatively relevant SNPs is necessary. Joanna Zyla, Paul Finnon, Robert Bulman, Simon Bouffler, Christophe Badie and Joanna Polanska contributed equally to this work. Authors would like to thank to anonymous reviewers for their helpful and valuable suggestions, and to Anna Krawczyk, the author of SNPLab software, for her help in data collection. The work was partially supported by NCN grant Harmonia 4 no. UMO-2013/08/M/ST6/00924 (JP, ChB, and SB), and SUT grant BK-2013/Rau1/10 (JZ). Additionaly, Joanna Zyla is holder of scholarship DoktoRis - Scholarship program for Innovative Silesia. Publication of this article has been funded by NCN grant Harmonia 4 no. UMO-2013/08/M/ST6/00924. All authors have made equal contributions to the conception and design of the study, drafting the article or revising it critically for important intellectual content and final approval of the version to be submitted.